It’s time for the Terps to pack their bags and get back to life on the road. COLLEGE PARK, Md. — It’s time for the Terps to pack their bags and get back to life on the road. “Teams are going to be really good and atmosphere is going to be crazy so we got to be ready,” said guard Anthony Cowan. “We’ve got a lot of tough teams. This next stretch of games is going to be tough,” added forward Jalen Smith. Maryland (17-5, 8-3) plays four of its next five games away from Xfinity Center. “What’s tough is we’re coming off three out of four on the road. Now we’ve got four of our next five on the road. I don’t know who does that to a team, to be quite honest with you, but arguably the best, maybe the toughest stretch,” said Maryland Head Coach Mark Turgeon. Over the next four games the No. 21 Terps play three ranked teams, starting Friday when they visit No. 24 Wisconsin (15-6, 7-3). The Badgers haven’t lost since a four-point defeat in College Park back on the January 14. In that contest they overcame a 21-point deficit before succumbing to Maryland. 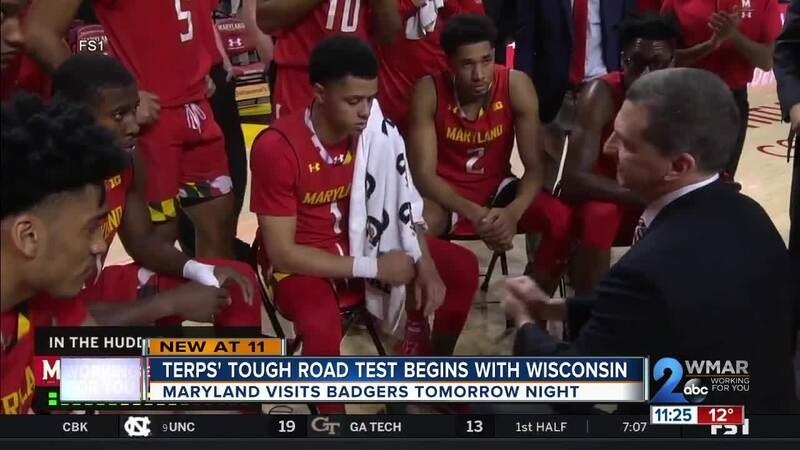 Maryland heads to Wisconsin after getting right. They ended a two-game losing skid by routing Northwestern 70-52 on Tuesday. It was a game that proved the Terrapins can do it without relying so much on Cowan. The motor that makes Maryland run only played 19 minutes after running into foul trouble. “It just proves that in crunch time, even in bad situations like not having (Anthony) or not having Bruno (Fernando) we can still maintain,” said Smith. “We’ve become a deeper team. Guys are ready to step up when they have to. That was good to see,” added Turgeon. Friday’s game in Madison tips off at 9:00 p.m.